Dossier: Gibson, William. Neuromancer (Ace, 1984). Executive Summary: Case used to be a console jockey and data-thief. Until, that is, he tried to steal from his employer. When their agents caught up with him, they injected a mycotoxin into his bloodstream--making it impossible for Case to access the virtual dataspace known as “the Matrix.” Out of work and suicidal, Case makes ends meet as a smalltime hustler in the Japanese port city of Chiba, where he fences goods for other lowdown expatriates, half hoping someoneone might take a shot at him and put him out of his misery. Only, one day a street samurai named Molly Millions tracks Case down so her ex-SpecOps boss Armitage can make him an offer he can’t refuse--a procedure that will counteract the mycotoxin. The only thing Case has to do is steal a ROM from a protected data library, one that contains the “ghost” of his former mentor, Dixie Flatline--at which point the real mission begins. Case, Flatline, Molly and the sociopath/holographic illusionist Peter Riviera must break into one of the most heavily protected data libraries in existence--located in the orbital headquarters of business clan Tessier-Ashpool--and free the artificial intelligence known as Wintermute. High-Tech: The operative technologies in Neuromancer are cybernetic, with the most distinctive pertaining to how the cybernetically enhanced interface with “cyberspace,” a virtualized datafield not unlike an internet you could navigate by proxy, as if physically present. Individual “jockeys” access “the Matrix” (the name for the actual datafield, as opposed to its virtualization) by “jacking in” to a “deck,” such as the ubiquitous Ono-Sendai Cyberspace 7--which is to say, plugging a cord into a neural implant on the side of the head and connecting it to the deck. Jockeys largely enter cyberspace for profit--sneaking past corporate “ICE” (i.e. security programs) to obtain data illicitly. “Microsofts” are another form of cybernetic enhancement, small microchips inserted behind the ear that grant the wearer tangible skills in the physical world, such as mastery of language. These don’t play a huge role in Neuromancer, but are instead an element of worldbuilding. Gibson also largely predicted the rise of reality television with “simstim,” recorded experiences in which the user experiences a full array of sensory information recorded by the actor. Though cyberpunk is primarily known as an earthbound style of science fiction, much of Neuromancer actually takes place offworld, meaning that space ships and orbital habitats play a far greater role than one might assume. And, of course, one of the novel's central preoccupations concerns the nature and ambiguities of artificial intelligence and how created sentience might interact with its progenitors. Low-Life: The future envisioned in Neuromancer is one of unimpeded urbanization, to the point where the stretch of coast linking New York to Atlanta is now simply referred to as “the Sprawl.” These, and other, urban environs are decidedly rough-and-tumble, marked by overcrowding, rampant criminality and an extremely thin state presence. The well-to-do, as it happens, are not only gated away from the masses, but reside offworld in lush, fully-appointed orbital habitats. In the novel’s opening section we meet Case, the former jockey turned small-time fence and hustler, in the dangerous and expatriate-heavy port section of Chiba, Japan--giving the novel a decidedly neonoir flavor. As action moves offworld, the sociological lens shifts to the capital classes, much as Chandler’s novels do when action brings Marlowe to the wealthy enclave of Bay City, and with a similar air of rot and decadence. Legacy: Neuromancer is the single most important work of cyberpunk ever written, likely the most important work of science fiction published in the 1980s, and may even be one of the five or ten most influential science fiction novels ever written. Simply put, it’s one of those books that changed pretty much everything that came after it. In Retrospect: There are reminders of Neuromancer’s age littered throughout its text. People smoke a lot of cigarettes, networks are accessed with plugs and wires and there is not a single cell phone to be found, smart or otherwise. And the whole “future is Japanese” thing, a reflection of the early 1980s zeitgeist, seems quaint today (considering Japan’s ongoing, multidecade recession and the concurrent ascendance of China to economic superpower status). But these moments aside, it’s amazing how well Neuromancer holds up. 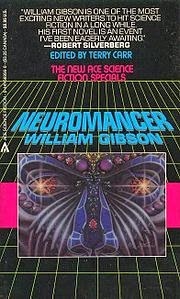 The book still feels amply futuristic, and though Gibson’s prose improves as his career progresses, the writing is remarkably thick with allusion and metaphor, yet still quite readable--lending Neuromancer an exhilarating, experimental feel that recalls the best of the New Wave. From 2015, of course, the opening Chiba section reads like an encyclopedia of cyberpunk tropes that have long since passed into cliche--which is incredible to think about, given how many were shown first light here (or developed from Gibson’s earlier short fiction). But it also strikes me that this section is pretty much all I remember from my first read some twenty-plus years ago. The offworld sequence, which takes up the most real estate, isn’t at all what one thinks of when the term “archetypal cyberpunk” springs to mind, and that’s a major reason Neuromancer can stand the test of time. It’s not a one-note symphony, but a complex, variegated and deeply insightful novel that by and large lives up to its reputation. However, I will note that the plot doesn’t really make a whole lot of sense when you really think about it--half the characters, for example, are basically superfluous. But that didn’t detract from my enjoyment of the book. Actually, as far as I’m concerned, Neuromancer is less about the destination as the ride--a magnificent tour of Gibson’s exotic yet familiar and (in many if not all ways) still deeply plausible vision of the future.